Brian sent me a New York Times article today... Is Junk Food Really Cheaper? The article basically compared a meal from McDonald's for a family of four to a meal that you could cook at home for 4 to 6 people. I appreciated him sharing the graphic with me, which was what he was really trying to express. Little did he know that I would actually read the article, which was actually somewhat scary and disgusting as far as the statistics they were doling out. For example, "fast food companies spent $4.2 billion on marketing in 2009". How can vegetables compete with that? So, I proposed that we try to do better about cooking. We don't eat fast food for dinner, but we do have difficulty cooking healthy meals. And as the article suggests, cooking feels like a job. It shouldn't, it should be fun and experimental, and a time to hang out with one another. We're a team, we are smart, we can do this! 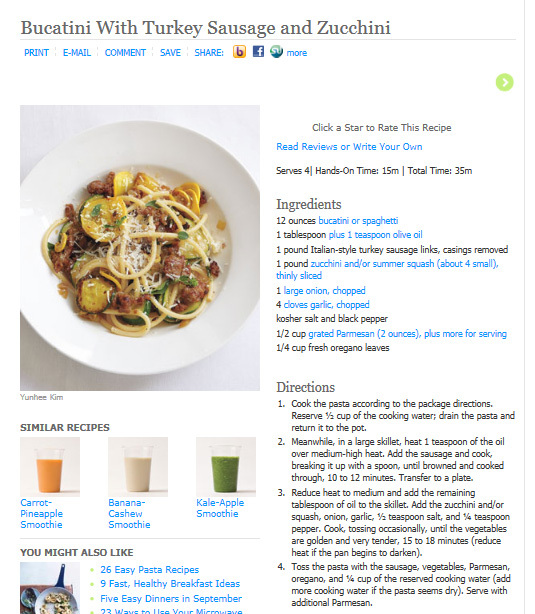 About a month ago, I signed up to receive a recipe a day by email from Real Simple. And today, I decided to put one of those recipes to good use. Of course, I modified it slightly with the ingredients that I had, and I pretty much halved the recipe. The only thing I had to purchase on our way home from work was the Italian-style turkey sausage links. Easy peasy. This particular recipe is called the 5-Star Pasta Dish. It's basically spaghetti, squash, zucchini, onion, garlic, olive oil, oregano, salt & pepper, and the turkey sausage. Unfortunately, Brian was dealing with an issue in the yard, but that's a whole other post. So, that left me to do it myself. With all my ingredients and laptop on hand, I set forth to cook us a healthy, easy meal! It truly was as easy as boiling water. I chopped all the veggies, while I cooked the spaghetti and the turkey sausage (the grossest part was probably de-casing the links... ooh). Once the meat was cooked, I removed it from the pan and added the vegetables, garlic, olive oil, and salt & pepper. Cooked that for about fifteen minutes and then poured it all together in a bowl. It turned out great. It was a little strange to be eating spaghetti without any sauce, but the flavors more than made up for it. Although a little something extra might be nice next time. All in all, it was a success, and good thing I only made half because we actually had a lot of leftovers! On a side note, and speaking of cooking, I wanted to share a few tips that I got from a repair man this morning... this will make sense shortly. We have found a renter for our condo, but the washing machine needed to be repaired, so I called the first company that came up on Google. 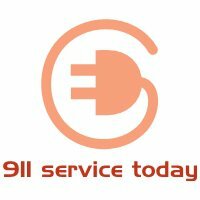 For you locals, that company was 911 Service Today, and Arik was AWESOME. I want to scream from the rooftop, that this guy is the best! First off, they quoted me a comparable price to other companies I called, except their price included service. He showed up on time, and immediately knew the problem with the washer. Then he proceeded to fix it, all while telling me every move he was making and why! After that, he walked me around the kitchen to tell me little tips and tricks for each appliance. We were also having an issue with the disposal (it hasn't worked since the worst renter in history moved out), and this guy just put some ice cubes down the drain, turned it on, and voila! The man is a magician! When it came time to pay, he pulled out his iPad, sent me an invoice, and charged me the same price I'd been quoted over the phone! I felt like I got a 2-for-1 deal! So here are a few of the tips he shared, that you too can use in your home! If you have an over-the-range microwave, always use your vent fan when cooking on the stovetop. The condensation from the pots will seep into the control panel (keypad) of the microwave and ruin the whole machine, which will in turn require you to replace the whole unit. Vacuum out from under the refrigerator at least once a year. Did you know that the lifespan of an ice maker is generally 2 years? We have 2 that need to be replaced. It isn't necessary to run your heat settings on the dishwasher. It causes your electric bill to skyrocket. Before running a cycle of your dishwasher, run the hot water in the sink, to get the hot water to your dishwasher. It's also a good idea to run the hot water before turning on your disposal. Use jet dry in your dishwasher to keep your utensils from tarnishing/rusting. The water will cause rust no matter if you have expensive or cheap silverware. He also recommended using powder detergent, and he discouraged the use of the little plastic tablets that the plastic is supposed to melt away. He says a lot of the calls he gets about dishwashers end up having little plastic casings clogging them up. Vacuum out dryer vent on the exterior of your home at least once a year. All is great advice that we started implementing in our house tonight! Great tips thanks! I just got a dishwasher and OTR microwave in my old house and am lured by those fancy plastic tabs and glitzy packaging. Now I know better!